On my latest business trip to Dubai in the United Arab Emirates I stayed at the wonderfully luxurious Burj Al Arab Hotel and it truly was the most impressing hotel I have ever stayed at. Everything was taken care of and arranged to perfection from the suite to the catering. The Burj Al Arab in Dubai is yet another good example of how the United Arab Emirates are taking over this market and placing themselves on the world map as a player in every important sector, not leaving out of account tourism. Perfect hotel for a business occasion but not only. The location of the Burj Al Arab, on an artificial island just out from Jumeirah beach makes it also a very romantic and beautiful place to spend ones holidays. 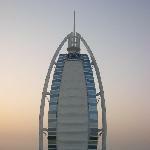 Did you enjoy Burj Al Arab Hotel in Dubai and have you been on a holiday in Dubai, United Arab Emirates?